The machine consists of six parts: unwinding, rectifying, laminating, accurate die cutting, slitting, finishing and rewinding. 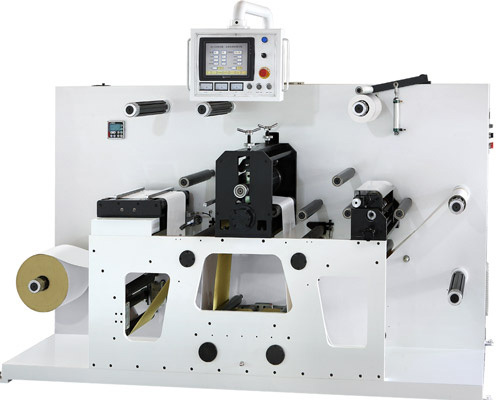 According to the products need to use the rotary die-cutting or intermittent cutting, choose the intermittent die cutting and tape, correction system of regional tension consistent (traditional intermittent to block the edges of the paper), will not happen in the process of conveying offset cutting products. Intermittent die-cutting using magnetic roller, no change, die-cutting, different products only need to replace flexible die-cutting. The utility model has the characteristics of high speed, high precision, simple operation, improved work efficiency and lower cost. Especially suitable for large, medium, small batch and high quality requirements of label die cutting. Large quantities of products, just in the touch screen to select the full rotation, replaced with the corresponding die roller, you can achieve full rotation die-cutting. 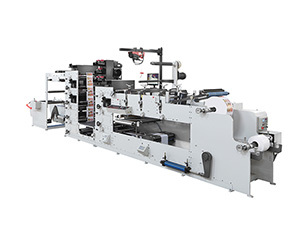 Greatly improve the quality of label die-cutting and production efficiency, for enterprises to create greater profit margins, the printing machine is essential for the ideal die-cutting equipment.